Barn Appétit: I am speechless, me speechless? well, almost speechless. Actually, I am vacillating between speechless and babbling about this recipe. It is all Lisa's fault. If she had not taken such a beautiful photo and posted the photo and the recipe on her site, I would be doing something else right now. While loving this recipe in its original form, I am certain that it would be a fantastic underlayment for Shrimp and Grits, Barbequed Shrimp, Poached Eggs...you add your ideas and fill in the blank here_______. Just keep in mind, it is: 1)easy to make, 2) easy to store, 3) beautiful to look at, 4) delicious, 5) adaptable. You cannot go wrong. 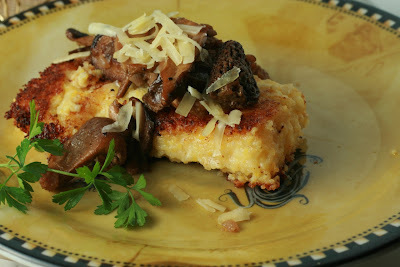 Think crisp outside, soft-centered polenta topped by earthy, buttery flavorful mushrooms. What a deal! Generously butter 13x9x1- inch baking sheet. Bring milk, broth, and bay leaf to simmer in heavy medium saucepan. Remove saucepan from heat; cover and let steep 20 minutes to allow flavors to develop. Discard bay leaf. Bring liquid to boil. Gradually add polenta, whisking constantly until smooth. Reduce heat to medium-low and cook until polenta is very thick, stirring frequently, about 10 minutes. Stir in Comté cheese and butter. Season to taste with salt and pepper. Transfer polenta to prepared 13x9x1-inch baking sheet. Using wet hands, press polenta evenly over sheet to edges. Chill until firm, at least 3 hours. Cut polenta into 20 squares. DO AHEAD: Can be made 1 day ahead. Cover and refrigerate. Melt 2 tablespoons butter with 2 tablespoons oil in large deep skillet over medium-high heat. Add all mushrooms and sauté until tender and browned, stirring often, about 10 minutes. Add shallots and balsamic vinegar; sauté until tender, about 2 minutes. Season lightly to taste with salt and pepper. DO AHEAD: Can be made 1 day ahead. Cover and refrigerate. Re-warm mushrooms in large skillet over medium-high heat until heated through. Add broth and simmer 1 minute. Stir in crème fraîche and half of parsley. Season mushroom ragout to taste with salt and pepper. Remove from heat; cover to keep warm. Comté is a semi-firm, Gruyère-style cow's-milk cheese made in France. 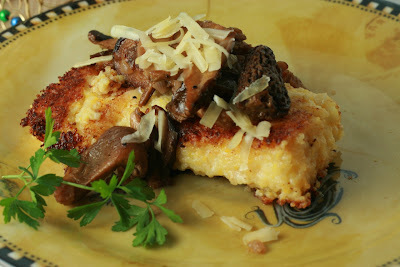 *Polenta can be found at some supermarkets, as well as at natural foods stores and Italian markets. If polenta is unavailable, substitute an equal amount of regular yellow cornmeal and cook it about half as long. Lisa of Lisa is cooking changed the original recipe by leaving out the creme fraiche and Comte cheese. Instead, she flavored them with green garlic, shallots and truffle salt. When making the Polenta, she used all milk for the liquid and a half cup grated parmigiano reggiano stirred in at the end of the cooking time. My note: I went back to the original recipe and used the dairy and chicken broth. This recipe is an impressive make ahead party dish that goes well with almost anything. In addition to being able to make ahead, it also stores well. Try it with or without the mushroom ragout. We had the Polenta re-warmed and topped with a fried egg for breakfast. Thanks for the link! The fried egg version sounds fantastic! That looks really good! I have not had much luck with frying polenta yet.